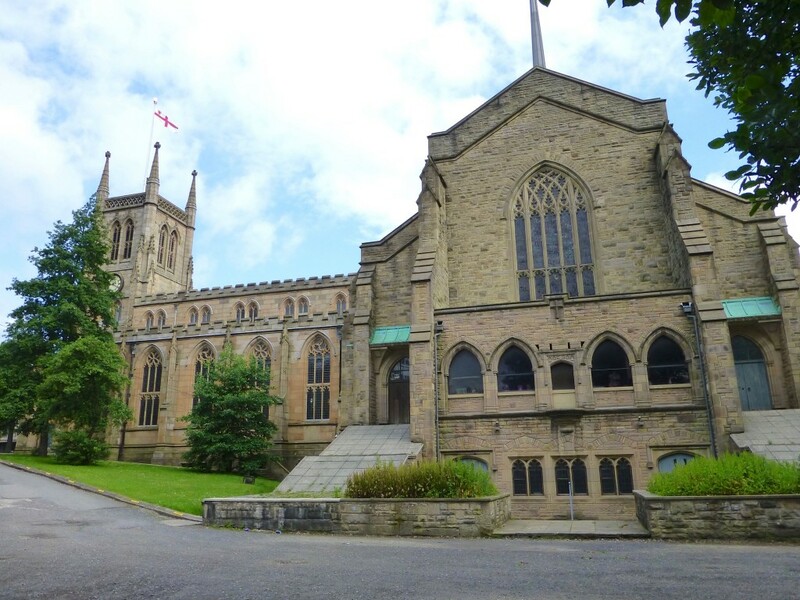 The former Parish Church of Saint Mary the Virgin Blackburn was elevated to Cathedral status in 1926 when the Diocese of Blackburn was created. The Parish Church was originally built in 1826 and work that began in the 1930s completed during the late 1970s and the current Cathedral was consecrated. The Dean and Chapter encourage peals being rung on the bells and we always welcome enquiries. There is no fee for quarter peals and for a peal attempt there is a standard fee of £5 a rope. If you would like to book the bells then please let us know. Most peals are rung on a Wednesday evening (with a 6pm start) and Sunday afternoons finishing with the bells rung down for the 4pm service. Recent changes (November 2015) in the one way system at the top end of Mincing Lane now require cars to turn left into King Street and then immediately right (Barton Street) and right again (Cardwell Place) to access Darwen Street via Astley Gate. If you are approaching from the west, Bank Top, then it is best to follow the road into Blackburn and carry straight on, when the roads turns right, into King Street. At the end of the one way section of King Street turn left into Barton Street and right into Cardwell Place to access Darwen Street via Astley Gate. on Darwen Street (pay and display) there are various bays in Darwen Street just down from the Market Street Lane junction and all the way down. Outside BBC Radio Lancashire is popular, but there are only a few spaces. During the week and a weekends there is a pay and display car park next to Fleming Square with the entrance at the top end of Mincing Lane. This car park charges £3 for 5 hours parking and it very close to the Cathedral. Since building work commenced in 2014 there is very limited parking available in the Cathedral grounds. You are politely requested not to park on the flags outside the west entrance. For parking in the town centre I recommend the Visit Blackburn website. This provides details or car parks. There is a good quantity of on street parking available in Darwen Street and Saint Peter’s Street. Please check carefully as parking changes almost as often as the one way systems. The current bells were cast by John Taylor and Co of Loughborough and were installed in 1949. More details are shown below. 8 12-1-22 3' 5" F# This belfry was restored and the clock, with chimes, renewed in 1949. T. Stirrup, J. W. Wilson, J. L. Heppard, V. J. Abbott, Churchwardens. 9 17-2-23 3' 10" E In memory of those of this congregation and diocese who gave their lives in the war 1939-45. 10 25-1-14 4' 4" D This peal was recast and enlarged in 1949, while extensions to the Cathedral were being made. W. Hare, Treasurer, Cathedral Fabric Funds from 1934, and of the Bishopric in 1926. Prior to 1949 the Cathedral had a ring of ten bells 15cwt in F. The back six were cast by Rudhall of Gloucester and four trebles were added in 1852 cast by Mears & Co of Whitechapel Bell Foundry, London. This entry was posted in Lancashire Association, Ringing, Towers and tagged Towers on 28th October 2015 by Ray Hutchings.